Pierre-Simon Laplace was a mathematician and astronomer of French origin. His pioneering work included the theory of probability and statistics. This study can be defined as the use of numbers and mathematical formulae to calculate the chance of an event occurring. The ability to get such numbers helps in predicting trends and outcomes. Laplace’s work also included various studies on the solar system, with the focus being on its stability. His work earned him the title the ‘French Newton.’ Pierre was born into a low-income family, prompting the need for neighbors to fund his education. He was sent to study theology at 16, but developed interest at mathematics and his journey in science began. Pierre-Simon Laplace was born in Normandy, France, on the 23rd of March, 1749. His father was a farmer. His educational costs were footed by wealthy neighbors who stepped in to intervene in the schooling of this brilliant mind. It was his father’s idea to send him to study theology at 16, as he wanted his son to be part of the Roman Catholic Church. With the development of his interest in mathematics, at 19 he quit the Caen University where he was studying theology. His next major step in life was to become a mathematics professor at the Ecole Militaire, a position he would hold for seven years, between 1769 and 1776. It was during his time at Ecole Militaire that he wrote his first publications. His papers covered subjects such as mechanics, calculus, and physical astronomy, which earned him considerable recognition across France. Between the years of 1784 and 1787, he studied attraction between spheroids. This pursuit laid a foundation in mathematics for further studies about heat, electricity, and magnetism. Pierre was a great mathematician who found great joy in pioneering studies, laying the groundwork for greater understanding of mathematics and the solar system. In the years after that, Laplace would go on to contribute and publish extensively about gravity and the theory of probability. His methods suggested the existence of black holes – massive stars with incredibly strong gravitational pulls that prevented even light from leaving the surface. He was also of the opinion that sound traveled at different speeds in the air depending on heat (which we now know is true). In his time as a mathematician, he was regarded as the most brilliant mind in the field, someone with phenomenal ability. His perspective on probability, in particular, was that it was simple, common sense, enable him to reduce it to calculations. In 1788, Pierre married Marie-Charlotte, who was from Besancon. She was 20 years younger than him. They had two children, a son named Charles-Emile, and a daughter, Sophie-Suzanne. Pierre-Simon Laplace died at the age of 77, on the 5th of March, 1827. He was originally buried in Pere Lachaise, France. In 1888, his remains were moved to his family estate in Saint Julien. At the time of his death, Pierre had contributed a lot in both mathematics and astronomy. He chose to explore the unknown and lay avenues for a new generation of scientists. The Royal Swedish Academy of Sciences elected him a foreign member in 1806. Association and partnership with an exceptional mind will always improve the general image of such a big institution. 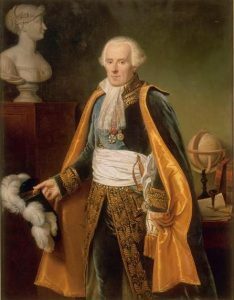 The American Academy of Arts and Sciences appointed Laplace an Honorary Member in 1822, furthering his institutional connections outside France. After Laplace’s death, his physician, Francois Magendie, removed his brain. The brain was on display for many years, and in the years after his death, it was in a museum of anatomy in Britain. It was reported to be smaller in size than the average brain. Many mathematicians have been part of the evolution of the science over time. Some names, however, stand out. The most memorable of these names discovered formulae and laid the foundation for the study of different branches in mathematics, such as algebra, geometry, and statistics. In Pierre’s case, his studies were the origin of fundamental theories. Still today, probability and statistics are a major branch of mathematics and used heavily in science. Laplace gained fame through the ventures he took into undiscovered areas of science, and a mind that was brave enough to cultivate thoughts beyond what was known to scientists at the time. This mathematician, more than anything, showed the value of developing mathematics as a science, not just getting conversant and working with existing knowledge.